Russia tries to remove images of Altius drone from the Internet. There’s not much that can be done to suppress a government secret once it is published on the Internet. But that hasn’t stopped Russia from trying. Earlier this month, a government website for the Republic of Tatarstan let slip never-before-seen images of a new Russian military drone apparently capable of conducting strike missions. Shortly after, the images vanished from the website—but not before they were snatched and reproduced by Russian news outlets and FlightGlobal. The Republic of Tatarstan is a federal subject of Russia located about 500 miles east of Moscow. The images of the drone, named “Altius,” were reportedly posted following a visit to the region from Russian Defense minister Sergei Shoigu on Feb. 5. 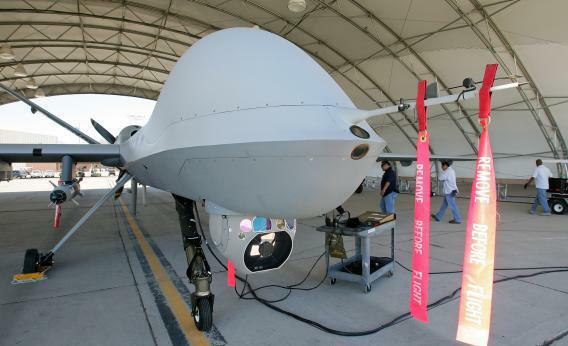 The Altius model depicted in the images looks somewhat similar to the “Reaper” drone used by the British and U.S. militaries, gray in color with high wings at its rear and a streamlined nose. FlightGlobal reported that two Russian companies—Sokol and Tranzas—won a contract worth $33 million in 2011 to develop two new drones, Altius and another smaller drone called “Inokhodyets” (which translates as “Wanderer”). A representative from Tranzas previously told the website ARMS-TASS that the systems are designed to be competitive with their foreign counterparts, to have “colossal range and endurance,” and to be capable of “all missions, including strike.” According to FlightGlobal, the drones are due to make their maiden flights in 2014 and enter detailed testing in 2015. Russia’s push to develop new drone technology is in line with what is happening across the world. While the United States and Europe invest heavily in building a new generation of stealth drones, countries in the Middle East, Asia, and Africa are also reportedly showing interest in getting their hands on the latest unmanned aircraft. Last year, Iran unveiled a new military drone, and earlier this week the United Arab Emirates announced a $200 million deal to purchase an undisclosed number of unarmed Predators from the U.S. firm General Atomics. Export restrictions remain in place dictating which countries can get their hands on American drone technology. But Reuters reported Monday that General Atomics is hoping to get approval to sell to more countries, especially in the Middle Eastern market. “We are talking to all of the Gulf (Arab) countries,” a General Atomics spokesman was quoted as saying. The use of drones for domestic surveillance and “targeted killing” has been a significant source of public controversy. But that doesn’t seem to be too much of a concern for military contractors—who look set to cash in regardless. Spending on drones is expected to double in the next decade, with sales worldwide estimated to be worth more than $89 billion over the same period.